We love a routine. Don’t we? Within two weeks this has become what I do, almost unconsciously. I see others playing out their own routines in the same way. I’m starting to recognise the same people at the station each morning, and being impressed with the ones who play it right down to the wire, arriving on the platform at exactly the same time as the train – an edge of the seat approach which I think would cause me to have palpitations, but it is an intrinsic part of their individual routine. So yes, we love a routine. And yet life is lived in a state of ongoing change. No two days are exactly the same – the people we see and speak to, the work we complete, the weather, our emotional state all lead to a unique daily experience. These changing experiences do not in fact cause most people to implode. Buddhism holds that everything is in a constant state of flux and we choose whether we accept change passively and are swept away by it, or whether we take the lead and create positive changes on our own initiative. Human nature leads us to consciously believe that we are uncomfortable with change but, when you break it down, we are accepting and adapting to change on a continual basis, in something of an unconsciously fluid zen state. My own new routine has become established, without any real thought, and within a very short period of time. If we can recognise and accept this then we can leverage our natural ability to work within change in our personal and our working lives. After all change is change, it is just the quantum and impact that varies. If we can view our routines as a tool for efficiently managing natural change, rather than as a coping mechanism to enable us to deny it is happening, then we can approach it in a more positive frame of mind, and on our own initiative. Surely that leads to a winning situation for everyone. I spent this weekend in Wales with a group of amazing women. My running club, exclusively for women only, arrange an annual walking weekend and this year twenty three of us spent the weekend in a Victorian workhouse, transformed into a fairly rustic hostel, in Llanfyllin in mid-Wales. I know how much wonderful variety we have in this group and so I knew that this would be a rich vein of inspiration for my next blog post. It didn’t take long to find that inspiration. My instinctive expectation was that I would be writing something about team roles, and how new groups work together to identify what those roles are. Not that we are a new group as such – many of us have known each other for several years. But the mix on the annual ramble varies each year, and these weekends are much more intense than our usual hour long chatty runs, and so there is a new dynamic to be formed. As it turned out though, the team element didn’t spark my interest quite as much as a realisation I had when reviewing the inevitable photographic posts on social media when we all returned. All of us had stayed at the same venue, participated in the same walks, sat on the same hillside for lunch, eaten and drank in the same pub, sat around the same firepit in the evening. My expectation was therefore a catalogue of approximately the same set of photographs from each of us. But as each person uploaded their photographs I saw something very different. A unique perspective reflecting each individual’s background and the impact of this on their experience of the weekend. My photos are generally broad landscapes reflecting my love of open spaces, others have snapped shots of the people in the group taken to tell the story of the weekend. Some shots are carefully framed close ups with a more artistic slant, some have a clear focus on food! Some posted a few choice photos, others posted everything they had taken allowing the viewer to sieve through and choose their favourites. Some chose to take no photos at all and simply to leave with memories. So this leads to a lovely montage of photographs but also to a serious point. If twenty three women, who are not exactly diverse in the broadest sense of the word, can have such unique perspectives on the same weekend, can you even begin to imagine how many individual viewpoints there are on every problem, every decision, every success, every failure, at every level and specialism in the workplace? I’m not suggesting for a moment that each one of these perspectives can realistically be gathered and considered in most business decisions – nothing would ever get done. But the next time someone challenges you, or you need to challenge them, remember that their perspective is unique and real. The next time you are involved in a decision that affects a number of people, remember that group is made up of individuals who are the sum of their own experiences. A little more discussion could help you to understand these unique perspectives and might just lead to a more creative and collaborative solution. Do you know what your natural talent is? It’s a great moment when you see someone who not only has a natural talent, but has found a way to make that an intrinsic part of their life and career. This weekend I witnessed one, and was told about another. On Saturday I went to see a production of The Call of the Wild by Jack London – which happened to be starring my best friend’s husband. When I say starring, he was the one and only actor in it. An hour and a half long, one-man performance, where he played the narrator and every character (human and dog) in the book. This involved a myriad of accents, mannerisms and physical movement, not to mention (and I may have already said this) AN HOUR AND A HALF of dialogue. I was absolutely mesmerised by the ability to remember and perform all this with no other cast members to bounce off or prompt – just incredible. He says it was the hardest thing he had ever done. I don’t doubt it – but I do know that you have to have a huge amount of natural talent to be able to pull that off. On the same day my best friend’s parents were telling me about their latest planned trip to Canada in September. It has been arranged through an independent travel agent – someone they had used previously for a trip to Australia and New Zealand. Booking a second trip through the same lady had happened by chance. They had bumped into her at a travel show and were amazed that, seven years and several hundred clients down the line, she recalled who they were and all the vital details about them and their travel preferences. This gave them absolute confidence in using her again for their next trip. Another great example of someone who knows their talent and has leveraged this in a successful career. This morning I dropped into a café and treated myself to a chilli hot chocolate and a bit of thinking time. It was one of those hipster cafes full of achingly cool people ignoring each other and tapping away on their laptops. For the record I am NOT achingly cool, I just really like their hot chocolate. Its only a small café, there were two people working, so you would expect, despite a menu of about 57 artisan coffees, teas and hot chocolates, not to have to wait for long for your drink. And yet I did – a good ten minutes. Not actually a problem – I never can get too excitable about such things anyway. It did however cross my mind that perhaps the manager was not leveraging a natural talent in his role here? But then I hesitated…. because his ability to keep his customers engaged while they were waiting was almost uncanny. He was keeping up a steady stream of very natural dialogue, chatting to everyone, engaging waiting customers in discussions about the history of the town, their suppliers, future plans, and how to make icepops for dogs. Despite the wait, he saw to it that there was absolutely no sense of frustration or tension in the waiting customers and that, particularly given the British love of complaining, is a talent in itself. All of the above, unsurprisingly, describe talents which have an external impact – they are about engaging people in some way – and they are easy to see. Others will have talents which are less obvious but equally as valuable, quietly making a difference. I have no idea what my talent is – unless fetching stuff off the top shelves of supermarkets for little old ladies counts – though I’m not sure that growing ridiculously tall counts as a talent in itself. And so I find myself envying those who do have a good understanding of their own strengths. Do you know what yours is and, more importantly, can you recognise and appreciate them in others? Perhaps if you don’t know what yours is, someone else does, so why not ask? Today something happened that has never happened before – I missed a flight. Heading to Alicante with two of my sisters and my 6 month old nephew for a few days relaxation in the sun, baby Jack had something of a bathroom malfunction resulting in us arriving at the gate 12 minutes after the gate closed and after our bags had been removed from the aircraft. Absolutely efficiency from a budget airline – who’d have thought it! We checked that there was absolutely nothing we could do and headed back to the start, rebooked a flight for later that afternoon, and went for a cuppa. And we sat down and laughed. Quite a lot. Now I know a lot of people who would have made a real fuss at this point, and would have wasted a whole load of energy on complaining, or blaming each other, and would have let it spoil their trip. Not for us, we were almost hysterical with how entertained we were by the whole situation, and it’s given us a good story to tell. It reminded me of one of the more important lessons I learnt in relation to coaching – identify the things that you can’t control, and put them to one side. There is nothing to be gained from focussing on what has happened when what you need is to find a solution to where you are now. That’s not to say that there isn’t value in reflecting on what went wrong to make sure learning is captured – I very much doubt we’ll find ourselves in the same situation again (famous last words) – but to deal with the here and now I strongly believe in staying calm and remembering Timon and Pumba’s wise words ‘Hakuna Matata’. And unexpected experiences bring unexpected upsides. 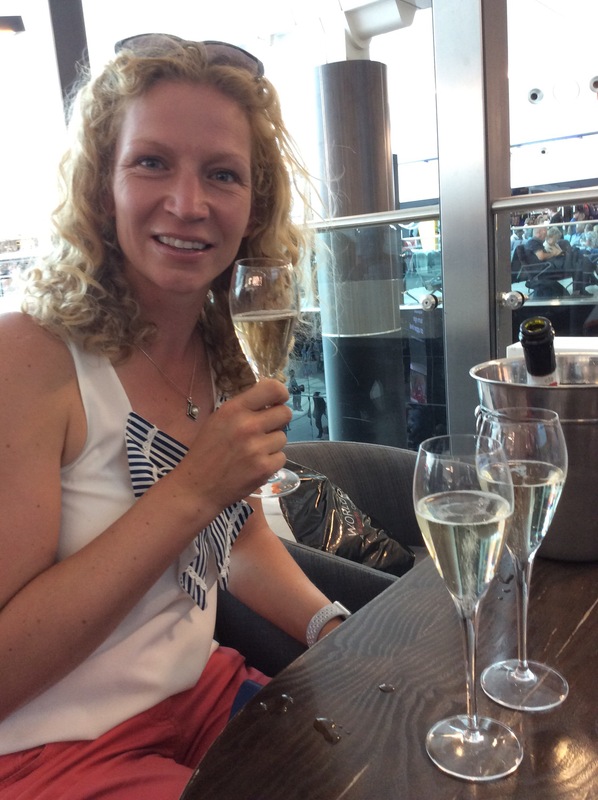 We have checked out the security process at Gatwick North and South terminals all in one day (South wins), and the second time round we’ve found time to visit the Prosecco bar while waiting for our gate number. Cheers.